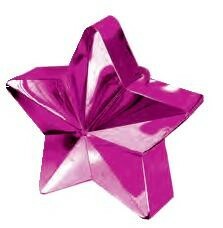 These are premium star balloon weights, suitable for holdings approx 6 helium or air filled balloons. The weights are available in different colours, quantities and designs. Matching balloons, ribbons, petals, confetti, lights, party goods and accessories are available throughout our website. A single star balloon weight. They are perfect for table decorations, valentine's, weddings, birthdays, room decoration and displays.